Antonio Margarito is getting ready to fight Manny Pacquiao, but took time to blast Oscar De La Hoya and his company Golden Boy Promotions during an interview with TV Azteca. 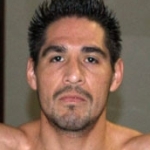 "I don't know what he has against me, I really don't understand, what I do know is that he had a big influence in the California State Athletic Commission with everything he said against me, I am upset because he talked too much and said some nasty things and he has a shady past himself that most of us know about," said a very upset Margarito to the Mexican TV. But if that was not enough he also sent a challenge to the Golden Boy. "I hope he takes off the fishnet, stop acting like a sissy and fight me, if you have something against me then get in the ring and fight," said Antonio who recently got a license to fight in Texas against pound for pound champion Manny Pacquiao. "I will knock Pacquiao out, and show the world that I am back, this is the fight of my life and Manny will be in for a tough night, I wont quit like De La Hoya did." Antonio's anger toward De La Hoya is nothing new, he challenged Oscar for many years trying to make a name off De La Hoya's fame and never got the fight.